Lender caution equates to scaling back leverage and construction loan allocations. Interest rates are rising and are projected to continue rising. Cap rates for multifamily, especially new development, have continued to decline and many investors fear that trend could cease or reverse. As a result, many seek a larger spread between stabilized cap on cost and pro forma exit cap rates. Equity has begun favoring more defensive positions as a preferred equity provider to approximately 80-85% of cost where they earn a fixed rate of return, rather than pursuing 90/10 J.V. structures that might put their last dollar as high as 96% of cost. Core locations developed at the right basis remain the “belle of the ball.” Development proposed in locations with a strong influx of new product or in suburban areas that are less insulated from a downturn receive a lot of scrutiny. For many projects, the simple fact is that apartment deals are becoming harder to finance. One of Fident’s recent assignments capitalized a 150+ unit project in top-50 MSA. The deal can succinctly be described as “on the bubble.” It pencils, but just barely. Conservative adjustments to more than one or two pro forma assumptions easily make the deal less attractive on a risk-adjusted basis than other opportunities competing for investment dollars. Fortunately, we sourced and structured a capital stack that holds an attractive construction loan (70% LTC at LIBOR plus 300) and an 85/15 JV equity partner that provides market-level profit splits. This was a tough assignment; we contacted dozens of capital providers for both debt and equity before securing vibrant partners under terms that the sponsor found acceptable. Not all projects of this nature are so fortunate. HUD 2212(D)(4) – the Apartment Financing Road Less Travelled. Our belief is that dozens of deals like are struggling to get financed. They need help. 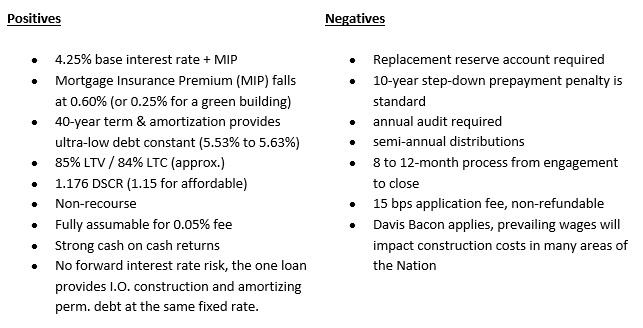 In these scenarios, a HUD 221(D)(4) (the “D4”) loan can bring new life to a project. We’ve known about the “D4” program for years and the construction/perm loan has always been compelling, at least on its face. It’s the bureaucratic nature of HUD, the admirative burden of closing these loans, and the long and opaque process that has always kept Fident from giving it material consideration, or recommendation. That changed when we met a top MAP (Multifamily Accelerated Processing) lender for HUD at the CREF/MBA conference earlier this year. In just 3 years, this firm has burst to the number 3 lending spot. They have done this, in part, by committing to clean business process and excellence in one thing, and one thing only: HUD loans. They have deep relationships with the vendors that service HUD and drive the D4 process to make it much more tolerable than if left to more passive project management. Further, their equity investor affiliates will take J.V. positions in these long-lived deals under the reasonably attractive structure of a 90/10 deal with an 8% pref. and a 60/40 split. This equity will also stay in these positions for 10 or more years. 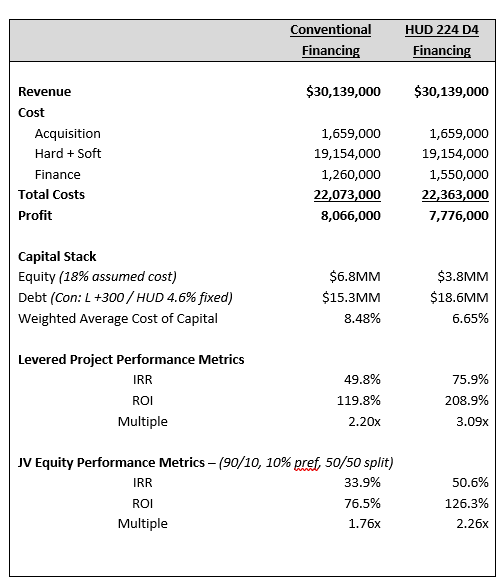 It was this firm’s vision for the HUD program plus their vitality and enthusiasm that compelled us to compare the traditional capital stack we sourced for the aforementioned “bubble deal” against D4 financing. Clearly, the HUD financing is highly accretive and compelling. However, both the equity partner and developer may need to change their thinking about investment duration. For a quick flip, traditional debt may be the way to go. It provides a quicker close and an open repayment. HUD’s 8 to 12-month process better suits a longer-term hold. To be clear, a sale could be consummated at or near stabilization, as the D4 debt can be assumed for only five basis points. However, removing the flexibility for a buyer to bring their own debt, or having to choke down the cost of early repayment on a 10-year step-down prepayment penalty could limit activity. Importantly, in a rising interest rate environment, a D4 could provide 60% LTC (an estimation) to a buyer at rates that are no longer achievable, thereby becoming an asset in and of itself. We’re not here to say that this HUD program is the be all and end all. But numerous apartment deals have found increased construction costs and conservative senior leverage a real challenge for equity investors to accept. If you marry a single high-leverage loan that can go 42 – 43 years at a fixed rate on a non-recourse basis, to a long-term investment view, these vehicles can be tough to beat and significant wealth creation tools.